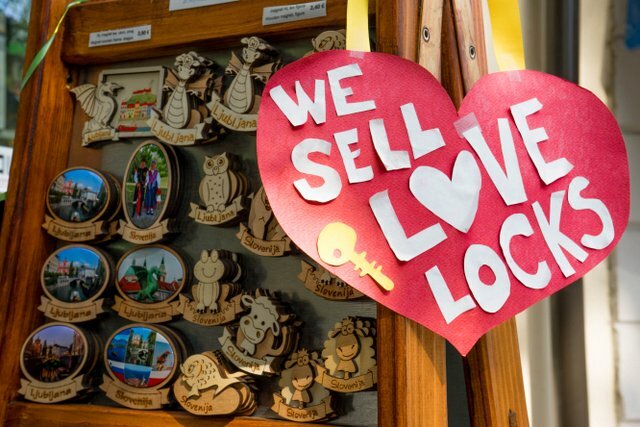 In the old town of Ljubljana, love is big business. They don’t mind if it’s true, mad, or deep, they just want you to buy a padlock. This oft-hated habit of demonstrating the depth and longevity of your love by attaching a padlock to a bridge or other structure has spread rapidly around the world. As you can imagine, the combined weight of the locks is massive and puts a great strain on the bridge. Many town authorities now regularly remove the locks in an attempt to save the bridge. On the other hand, some towns have sought to embrace the phenomenon, or at least to make what they can of the inevitable. Indeed, here in Ljubljana it looks as though the bridge in question has been specifically designed for the locks. In Moscow, they have erected metal “love trees” at Luzhkov Bridge specifically to host love locks. Whereas in Paris, they continue to remove locks from the worst affected bridges, and woe betide you if you attempt to take a lock up the Eiffel Tower! Hover over an image above to find out where the offending locks hail from. Linked to Depth and Ruby Tuesday. Yeah, it’s just reached some of our cities here. Wonderfull shots, greeting from Belgium . Very interesting! I’ve never heard of this custom before. Love lock is truly sweet culture, but I don’t agree if it harms the existing public structure. I’m lways drwan to them when I see them, but I think the damage threat is real. Moscow thought it serious enough to erect the trees to protect the bridges. Oh yes, we like coins in pools too. Never really understood that! There are Love Locks on a footbridge over The Yarra here in Melbourne – we also saw some last year on part of a pier in Burgas Bulgaria. Recently saw this bridge in a movie again and reenergized my fascination with it, and then THIS! The whole city is amazing – you must go! If you climb Mt. Tai in China, you see such locks too. This is really interesting. I didn’t know they removed locks. Now I know and will be careful when traveling. My husband and I found something similar when traveling to Miami, FL in America.